This month has gone very fast and I have been so crazy busy. 3 additional shows have happened since my first (Limerick Community Days, NJ Sheep and Wool [more about this below], and Phoenixville Farmers Market Fiber Fest) and I have been dyeing every week to keep up. I started 2 new jobs and a 3rd new one today, well, training starts today and ends hopefully middle of next month. I already do this same job for another University, so hopefully training will be quick and easy. This puts me up to 10 jobs, 7 of which are jobs I get some sort of legitimate paycheck for, but all of them are sporadic and seasonal so its not like I work all of them every week. The other 3 are my personal businesses of Graphic Design, Tattooing, and now the Fiber business. My schedule is nuts though and today is my first day off in about 3 weeks. I’m going to TRY and relax, try being the operative word there, even though my to-do list is glaring at me from the coffee table. The most exciting show I’ve gotten to do so far has definitely been NJ Sheep and Wool. It was the 20th year of show and just in the few years I’ve been going there it has really blossomed into a very nice, medium sized show. 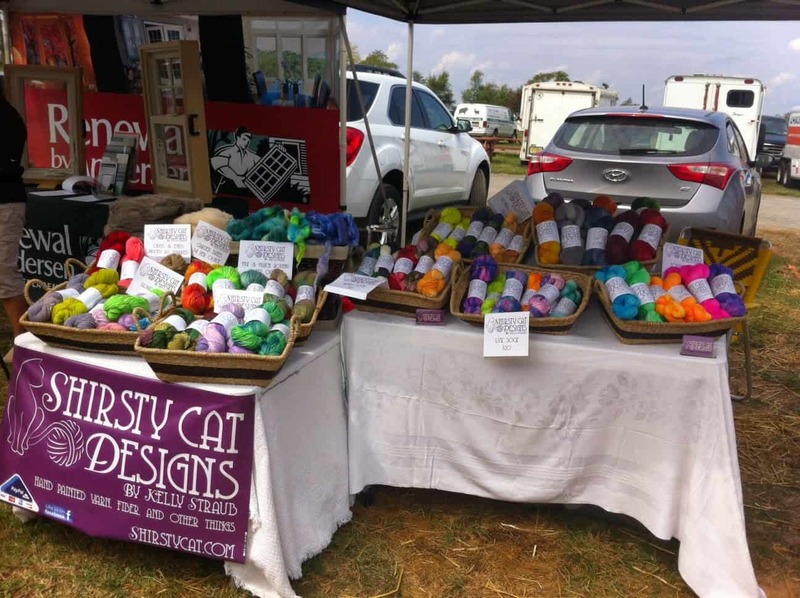 It is not nearly as overwhelming as say Maryland or Rhinebeck for first time fiber show goers and can be leisurely perused in just a few hours. When I found out I could still get in, even though the show was only in 2 weeks and I could only get an outside booth space, I jumped on it and made it happen. I’m really glad I did. We had a great show, despite the heat and rain on Saturday, which actually helped us being outside since inside the barns was so very hot. This is my booth halfway through the day after I’d already sold a lot of product. I’m really thankful for everyone who came and purchased and all my other vendor fiber friends who came around to congratulate me on finally getting started. I can’t wait to do this show again next year and by then I should have way more stock. This past Saturday was a wee little Fiber Festival at the Phoenixville Farmers Market. I frequent this market when I have the time and had no idea until the week before that they did a Fiber Fest. Someone actually asked via my FB page if i would be there and I was able to sign up and forward it on to my Alpaca farmer friend who also came. We both had good days, made a lot of new contacts and I think I might see about getting into their Artisan Saturday, which happens once a month. It will be a good spot to pick up knitting and spinning students. And my Website is finally operational HERE, not much on it yet, but I’m getting there. One of the biggest to-do list items is to photograph everything and get it up on etsy and finish the website so I can sell directly from there. Until then if you see anything you like, please feel free to email me or contact me on FB, we can set something up. But today I’m off. I need to be cause I’m not going to have another day off in a while and no matter how hard I push it won’t all get done today anyway. I’m going to work on my Ocracoke Cardigan and spin this pretty BFL Silk that was my only purchase from NJ Sheep and Wool. I already have 1 and a half of these bumps spun.